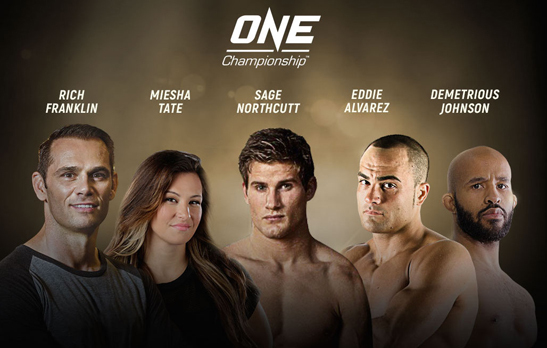 Singapore--The largest global sports media property in Asian history, ONE Championship, announced that CEO of ONE Warrior Series, Rich Franklin, and Vice President of ONE Championship, Miesha Tate, will join the upcoming ONE Championship US Media Tour to Seattle, Los Angeles, and Las Vegas. The two will be accompanying ONE Championship athletes Demetrious “Mighty Mouse” Johnson, Eddie “The Underground King” Alvarez, and “Super” Sage Northcutt. February 25, 2019 at the Southwest Boys & Girls Club in Seattle, Washington with Johnson. February 26, 2019, a Los Angeles Open Workout (Open to public) at the Clube LA Gym, with Johnson, Alvarez and Northcutt. February 28, 2019, a Las Vegas Open Workout (Open to public) at the Xtreme Couture MMA Gym, with Johnson and Alvarez. Multiple-time mixed martial arts World ChampionFranklin is the CEO of ONE Warrior Series, a travel series talent search which runs in 30-minute episodes. The show aims to discover new martial arts talent, providing promising young athletes with the platform to unleash their martial arts greatness. Franklin, who serves as the show’s host, travels with co-host Jonathan Fong, searching for talent, experiencing local cultures and testing their boundaries. Women’s mixed martial arts pioneer and former World Champion Tate is Vice President of ONE Championship and one of the most recognizable names in the industry. Tate retired from professional competition in 2016, and finished her mixed martial arts career with a 18-7 record. Her most notable victories came over Liz Carmouche, Sara McMann, Jessica Eye, and Holly Holm whom she defeated to capture the Women’s Bantamweight World Title.